In this letter, Peter spoke much about persecution, which anticipated the persecution he and other Christians would endure in the final years of Nero's reign. At the time he wrote, Peter had not yet been arrested, an event that would lead to his martyrdom around AD 66-68. First Peter 5:13 indicates that Peter sent greetings from the local church—calling it “Babylon”—but it's most likely that the apostle was writing in a common metaphor there. He used the name of the ancient Mesopotamian city as a stand-in for Rome, the modern city that, like Babylon, gave itself over to idol worship and false gods. While the fact is not recorded in the Bible, Peter has long been thought to have spent his final years serving the church in Rome. Based on the numerous references to suffering and persecution in this letter, Peter likely wrote in AD 64, just as the persecution of Christians under Nero was ramping up. Living in close proximity to Jesus Christ for more than three years had provided the Apostle Peter the best possible example of what it looked like to live in holiness amid a hostile world. More than any other man who walked the earth, Jesus modelled that lifestyle. Peter therefore pointed his readers in the best possible direction, to Jesus Himself. The apostle called Christians to “sanctify Christ as Lord” in their hearts, that believers might live and act as Jesus desires during their short time here on earth (1 Peter 3:14-18). This would include submission to authority—even unjust authority—in the government, in the home, and in the workplace. Jesus becomes the focal point for ordering one's life in the midst of trials and tribulations. By rooting their perseverance in the person and work of Christ, believers can always cling to hope in the midst of suffering. 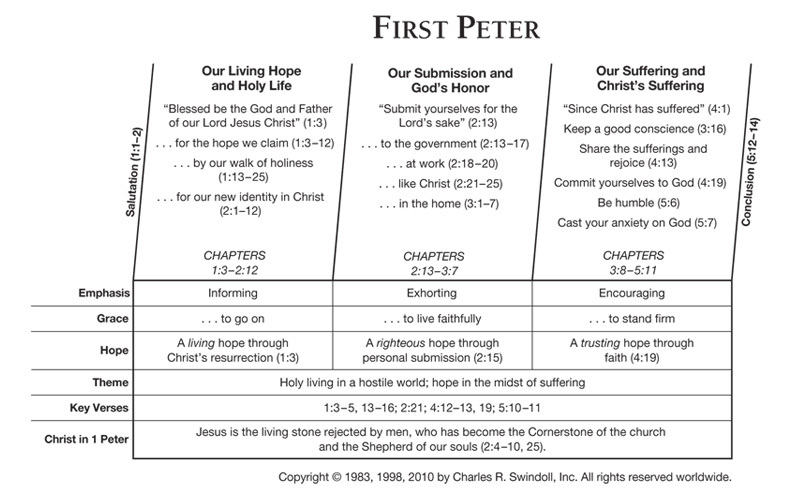 Find resources in the book of First Peter in our resource library.